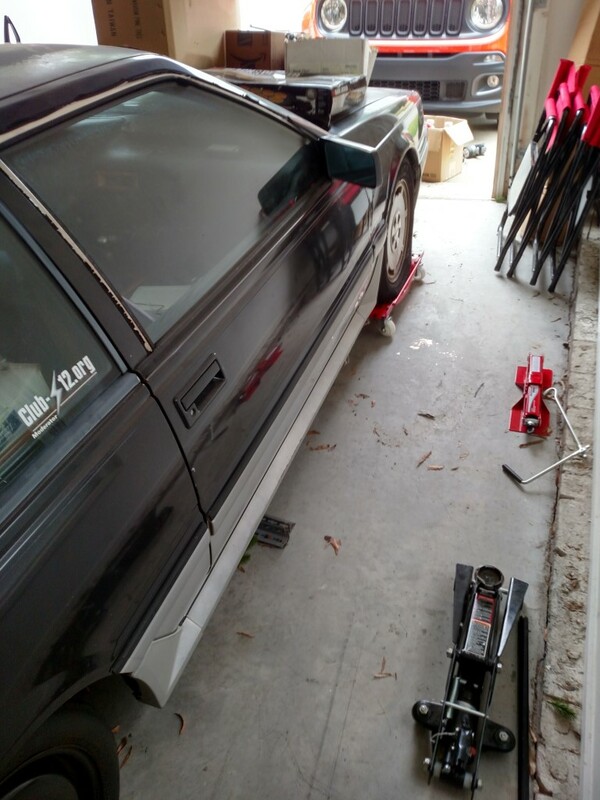 Club-S12 - It's been a long time, but Project SE Resurrection has begun! It's been a long time, but Project SE Resurrection has begun! Despite being a founding member and former moderator of this club, I haven't been around much at all over the last 4 years or so. But that's about to change. Life is relatively in order, my daughter is about to start kindergarten, and I close on a new house on Monday. The impending move has prompted me to start dusting off my 88 SE and working on getting the old girl mobile again so she doesn't have to ride a flatbed to the new house. 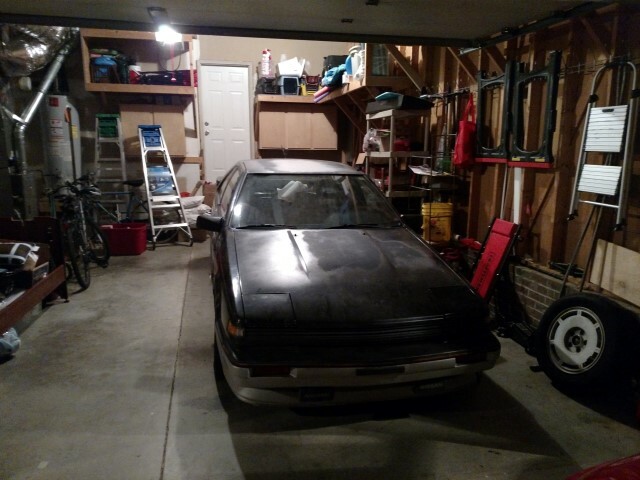 Also I'll get to start from scratch with the new garage and build a decent workspace. 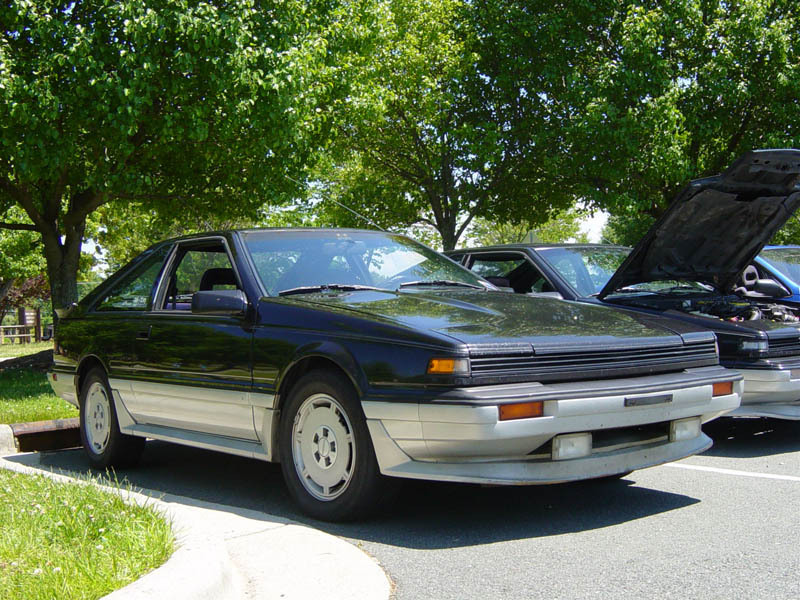 I DD'd my S12 from 2001-2009. 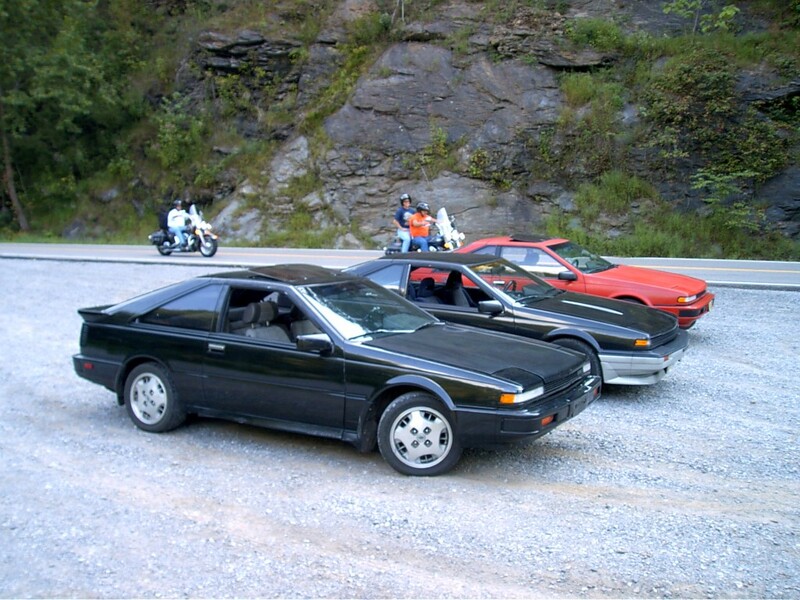 I was there as this club sprang out of the old Classic 200SX Yahoo! Group in what, 2002? And in 2006, after installing Canuck lowering springs. Hopefully someday before too long it'll look that good again, or even better. My intention was to prep the S12 for AutoX and other fun stuff, but life started getting in the way. I bacame a father in 2010. 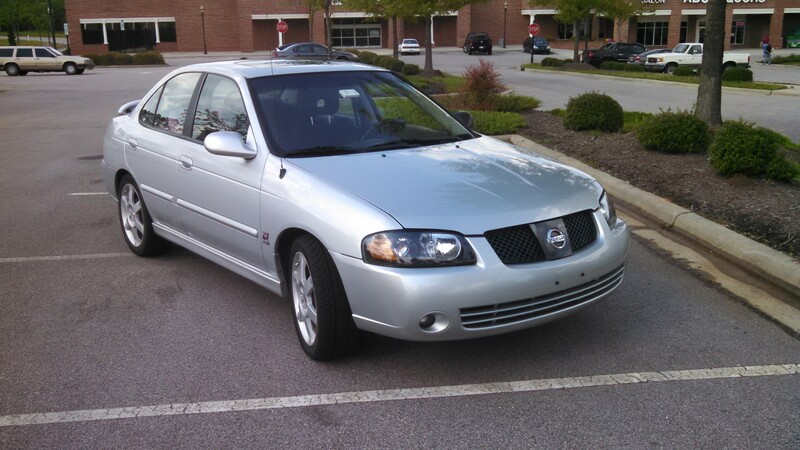 In 2012, when I got tired of getting my little girl into and out of the back of a 2-door, I bought a 2005 Sentra SE-R Spec V.
I sold the B14 to my brother for his first car. He only just sold it a couple months ago after graduating from college and buying a Scion tC. He sold the SE-R to a Nissan tech, so odds are it will keep kicking for a good while longer, despite being located in Buffalo now. Last year I decided to go in a bit of a different direction with my first brand-new car purchase. 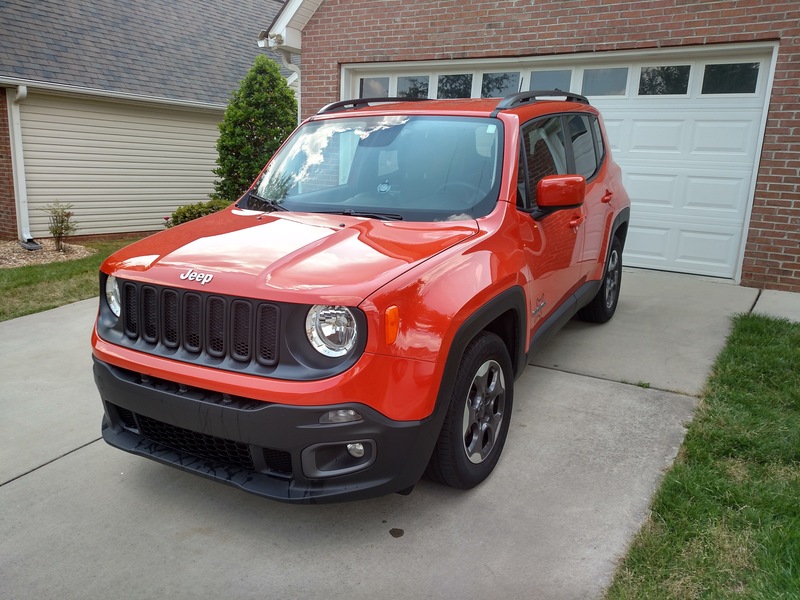 My current DD is this 2015 Jeep Renegade Latitude with the 1.4L Turbo MultiAir and a six-speed manual. 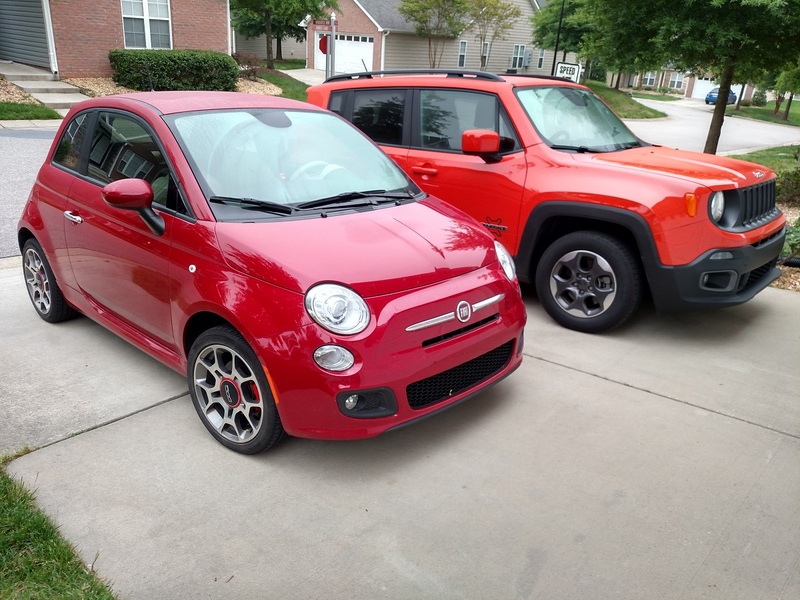 I think it's a nice match for my wife's '15 Fiat 500 which uses the non-turbo version of the same motor. Ironically, while the Jeep was assembled in Italy, the Fiat was built in Chrysler's plant in Toluca, Mexico. Weird. But they've both been great cars for us and we really enjoy them. I grew up with Chrysler products, and have always had a soft spot for them. I had a '94 Dakota Sport in college and moved all my worldly possessions in it from NY to NC after graduation. When people ask me what cars I like, I say, "Dodges & Datsuns" So when FCA introduced a modern vehicle that I actually found interesting, well there you go. Anyways, back to the S12. The first thing I had to do was pick up a couple wheel dollies, so I could slide the SE away from the garage wall where the flatbed deposited it when I moved into this townhouse. I also had to buy that red scissor jack because the one I had was corroded to uselessness, and with the lowering springs on the SE and two flat tires, I couldn't get the floor jack under it. It's been about 3 years since the car's been run. As of now she's got fresh oil, gas (with some cleaner added in) and coolant. The battery is dead, but I hooked up a booster pack and had power, and when I flipped the switch on the dash the electric radiator fans fired right up. I haven't cranked it over yet. My intention is to crank it for a bit with the fuel pump and coil wire disconnected, to get things circulating before I actually attempt to fire it up. 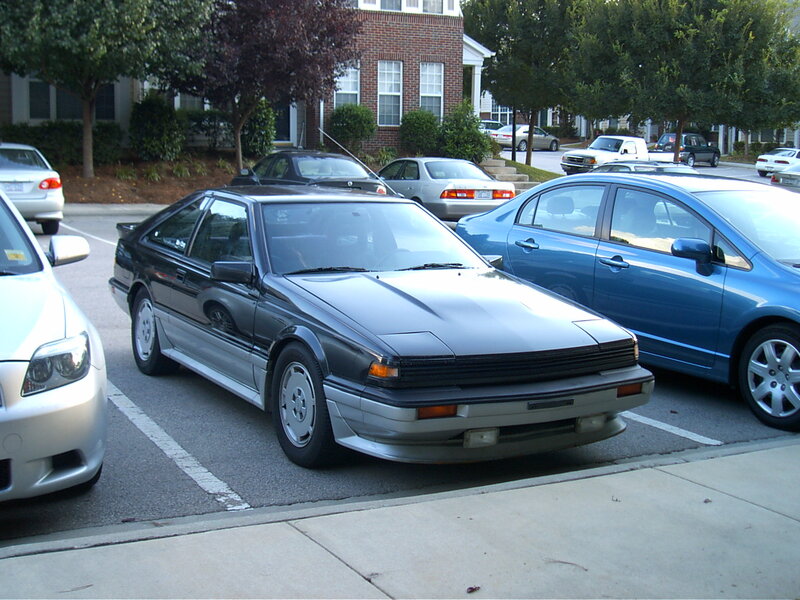 Once I get it to the new place, I'll be going over the engine, suspension, interior and exterior. It all needs some TLC. I expect I'll be prowling the forum for parts as the project progresses. Wish me luck, and I'll keep y'all updated. To the Club veterans that remember me, if you're still around give me a shout! Re: It's been a long time, but Project SE Resurrection has begun! Nice resurrection story and I'm sure a lot of guys can relate to life getting in the way of projects. I know I can. Too bad you waited so long to show up again. 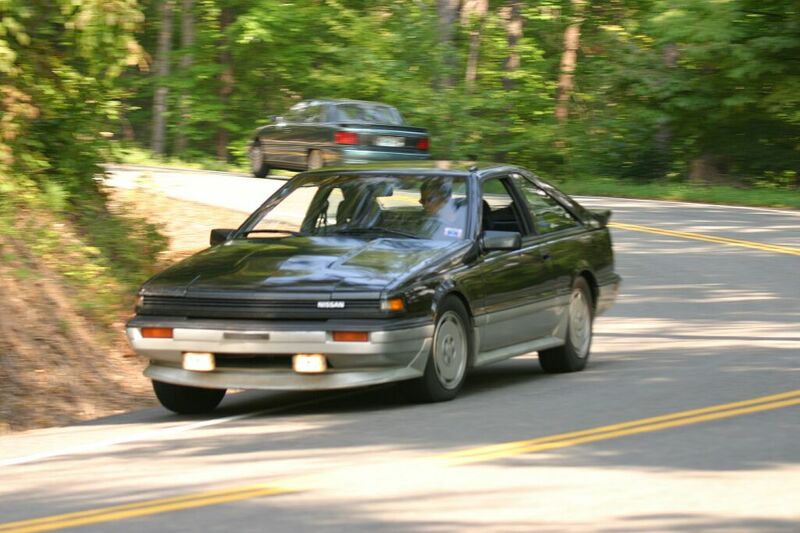 I'm going on my 22nd year driving an S12 and moved away from NC last year. It would have been cool to have hooked up with another owner. Nice to meet you kind sir! Thanks as a veteran for making this club exist - I do quick visits daily since joining. If you read any of my old posts you will see I daily my 85 that my wife bought new in 85. Still going strong, 340k miles thanks 100% to this club. I think you need to get yours back to DD status now that you are old and have kids like me! BTW I would pull the plugs and squirt some oil in the cylinders before turning her over. Wow just checked my profile, I've been here 5 yrs already - time flies by! Okay, over the weekend I was able to get the VG to turn over, so that's progress. It won't fire up, though. The first thing I noticed was that when I move the key to RUN, I hear the fuel pump relay, but no buzzing from the fuel pump. I checked the fuse, of course. So it looks like I'll be attacking that sometime this week. I checked courtesyparts (my go-to parts source back in the day), it lists the SE fuel pump as discontinued and unavailable. Rock Auto has a few listings, though. 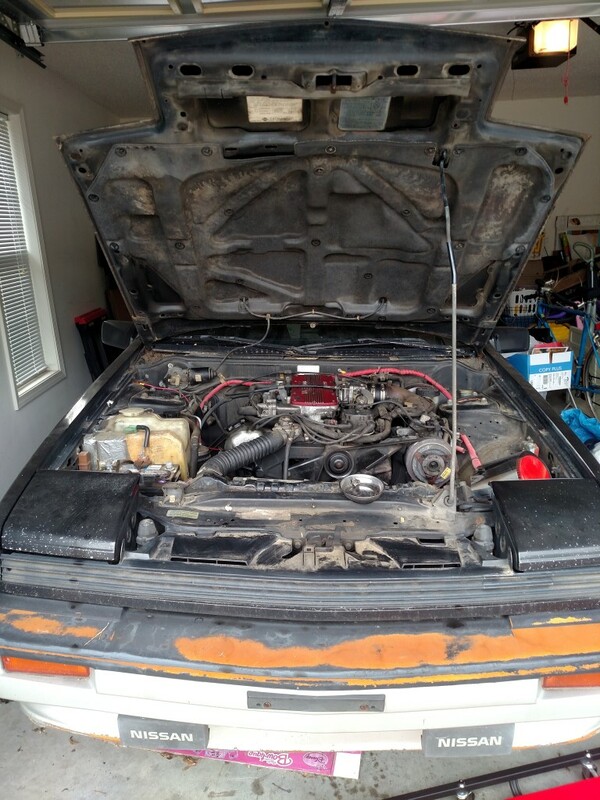 In my 84 turbo I went with a Walbro 195, it works great and was not a big deal to install. Cost a lot less than anything from Nissan. Yeah after I posted I searched through the forum backlog and found a lot of info about Walbro's, S13 pumps, etc. First things first I'll be pulling the pump and testing the connections. I'll also be checking for ECU codes, it'll give me a chance to see if the dash-mounted ECU output I wired up like 12 years ago still works! It's pretty corroded, and this is after I did some work with a wire brush, but I did manage to get all the pump housing mounting screws out but one, that one is seized and quite badly rounded. It's soaking in PB Blaster for awhile and I'll take another crack at it. What's the best way to go about testing if the pump is getting power, and can that be done before removing the housing? On a positive, I did click on the key and used the dash-mount button and LED's mentioned above to put the ECU in mode 3 to check the codes. It flashed out a nice "55", so no codes were thrown while I was trying to start it the other day, so that's a good thing, at least. What's the best way to go about testing if the pump is getting power, and can that be done before removing the housing? I actually might have an answer to that! 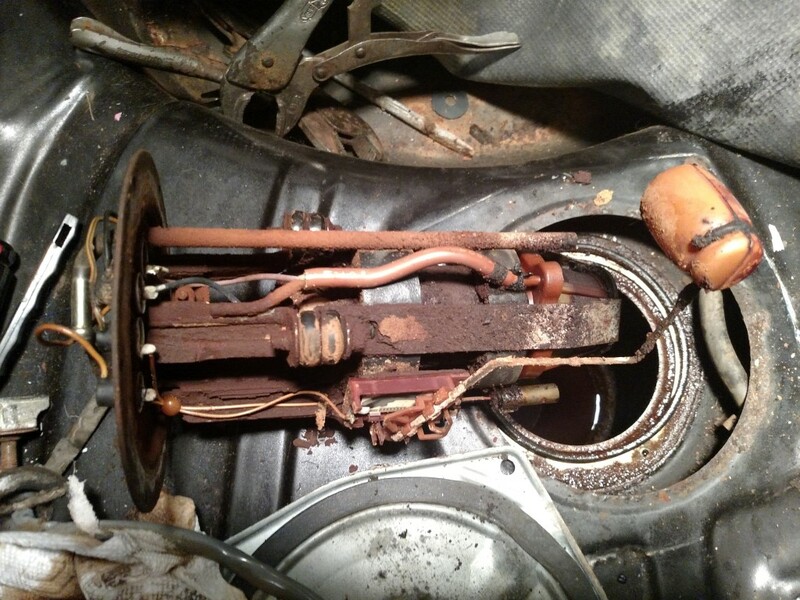 I had troubles with my fuel pump too, the short version of the story is that my friend got electric shock and that way we found out that the part of my ECU that controls the fuel pump is fried, good times . Anyway, I think your solution might be to connect the ground wire of the pump directly to ground (as default the ground wire goes to the ECU which might be busted in your case) and this way you'll bypass the ECU and the pump will always be on when you turn the key. At least I think that's what we did with it, electricity is not my kind of stuff... Btw. I think this will work only on Mk1 car, according to the manual the Mk2 fuel pump is controlled by a relay. Here are my two topics on fuel pump work I did on my 85. I assume you found the two harness connectors in the passenger side access door. Should be able to test for power at the harness. Your pump pic appears to have one less wire than my 85? If you read the entire thread you will see a changed a good pump when in fact the problem was cold solder joints in the ecu. Has worked perfect since re-solder. Well I tested for power at the wiring harness in the cubby and got 12V, so I proceeded to pull the pump. What I found was not pretty. Looks like water got into the tank. 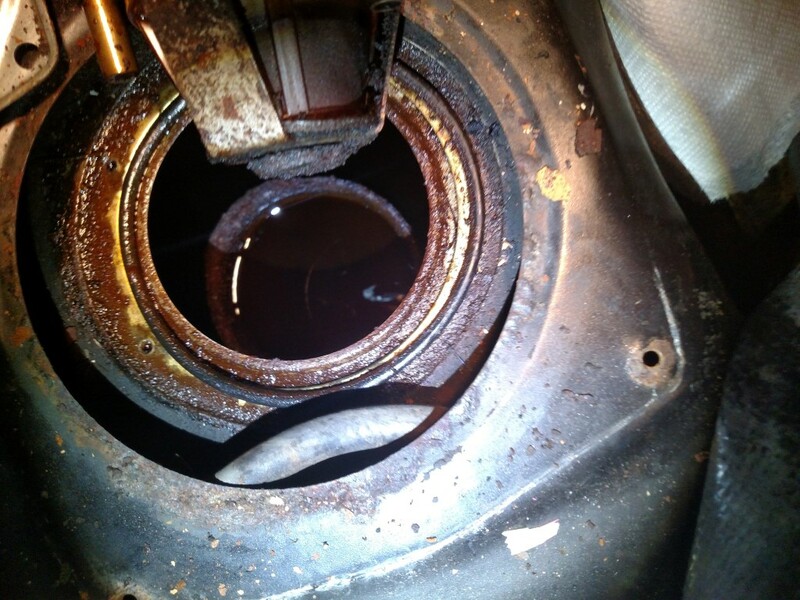 The entire pump and housing assembly is badly corroded, as is the section of the tank visible through the access hole. The little fuel that's in there is the color of muddy water. So it looks like I'll be in the market for a new gas tank and pump assembly. It may be possible to steam clean the tank & pump housing; don't give up yet! 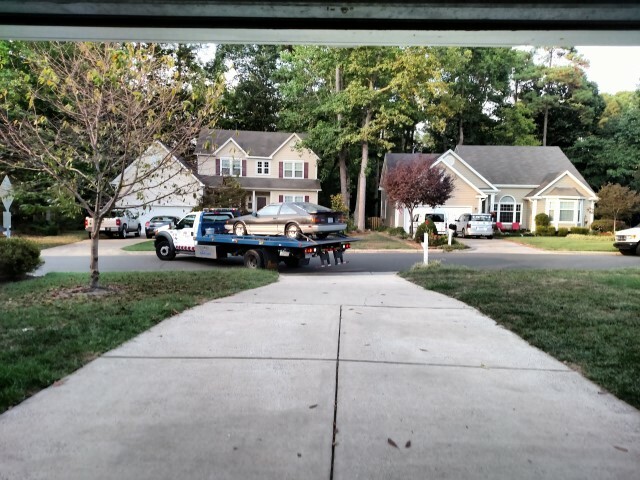 I got the fuel tank emptied out, and on Saturday the SE rode a flatbed to its new home. The next project is to remove the fuel tank for cleaning. Now that the weather is getting nicer, I've spent some time under the SE. After removing the fuel tank, I'm not sure whether or not it can be salvaged. 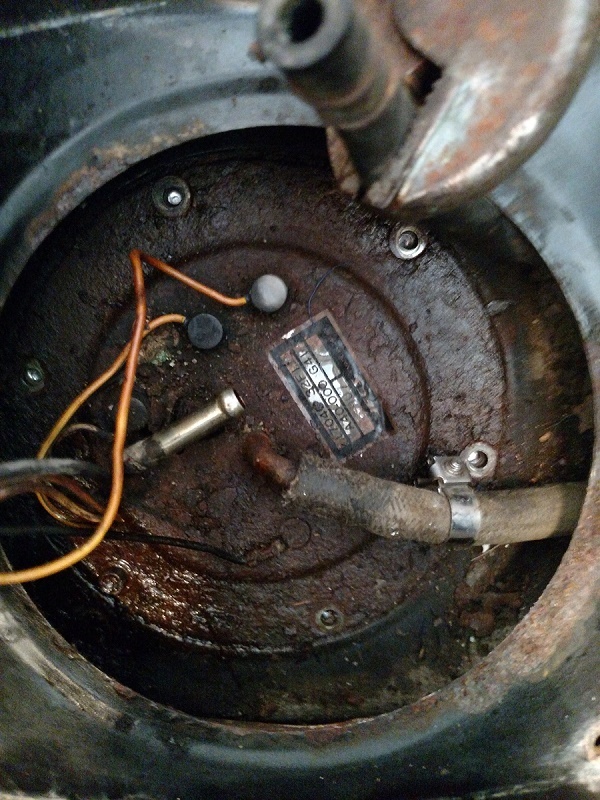 The circular well where the fuel pump sits has a thick layer of powdered-rust "sludge" in the bottom, and the entire interior seems to have light surface rust. I'm thinking of scooping out the sludge, then putting in a gallon or two of Evapo-Rust and soaking for about 12 hours, rotating the tank every half hour. Then we'll see what sort of condition it's in. 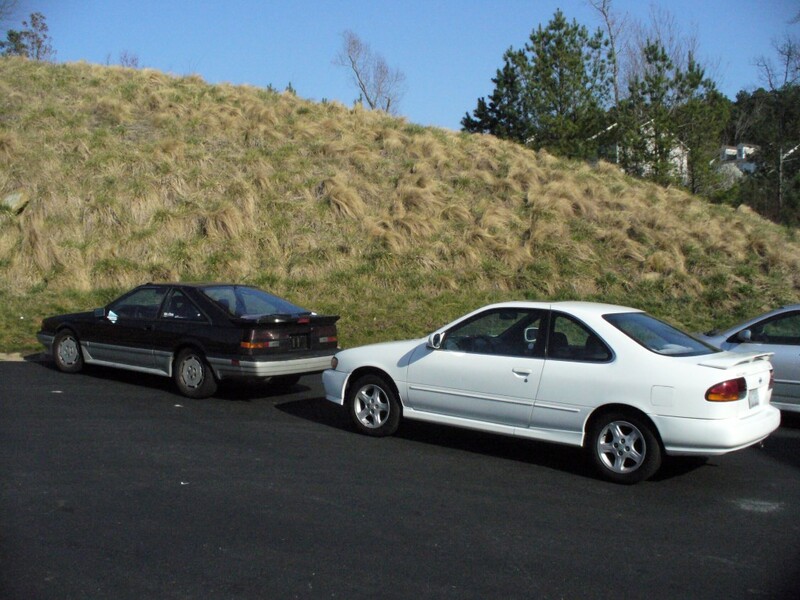 Sweet, the old guru of the v6-s12 is back, I used your site guide for a few revival of my sev6. I am actually might be in the same boat with the current project I am doing with very old gas, but since this was parked in the vegas heat it is not rusted out. So cleaning it should be easy.